Ajouter au panier le livre de PORQUEDDU C., RIOS S.
Several elements often typical of the intensive farming management (e.g.limited genetic resources for plant varieties and livestock), as well as land abandonment, have resulted in a decrease of biodiversity in agro-ecosystems. The grasslands representing around one-third of the total land area are a tremendous resource of biodiversity. This publication is the outcome of the 13th Seminar of the FAO-CIHEAM Sub-Network on Mediterranean Forage Resources "The contributions of Grasslands to the Conservation of Mediterranean Biodiversity" held in Alicante (Spain) from 7-10 April 2010, and includes the invited and selected papers presented at the meeting. The seminar was jointly organized by the Food and Agriculture Organization of the United Nations (FAO), the International Centre for Advanced Mediterranean Agronomic Studies (CIHEAM), the Iberoamerican Centre of Biodiversity - Alicante University (CIBIO) and the Spanish Grassland Society (SEEP). 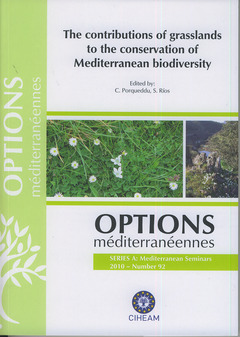 The seminar covered a wide range of topics that were allocated into four sessions: Mediterranean farming systems and their impact on the conservation of biodiversity, Selecting forage species and crops for lower inputs, Influence of grassland management and climate change on biodiversity and Improvement of biodiversity and methods for its evaluation in Mediterranean grasslands.